On September 23, 1998, the boardroom of the New York Fed was a tense place. Around the table sat the heads of every major Wall Street bank, the chairman of the New York Stock Exchange, and representatives from numerous European banks, each of whom had been summoned to discuss a highly unusual prospect: rescuing what had, until then, been the envy of them all, the extraordinarily successful bond-trading firm of Long-Term Capital Management. 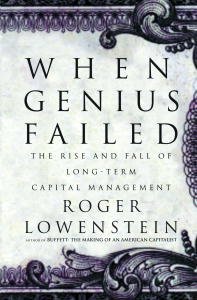 Roger Lowenstein's When Genius Failed is the gripping story of the Fed's unprecedented move, the incredible heights reached by LTCM, and the firm's eventual dramatic demise. Lowenstein, a financial journalist and author of Buffett: The Making of an American Capitalist, examines the personalities, academic experts, and professional relationships at LTCM and uncovers the layers of numbers behind its roller-coaster ride with the precision of a skilled surgeon. The fund's enigmatic founder, John Meriwether, spent almost 20 years at Salomon Brothers, where he formed its renowned Arbitrage Group by hiring academia's top financial economists. Though Meriwether left Salomon under a cloud of the SEC's wrath, he leapt into his next venture with ease and enticed most of his former Salomon hires--and eventually even David Mullins, the former vice chairman of the U.S. Federal Reserve--to join him in starting a hedge fund that would beat all hedge funds. LTCM began trading in 1994, after completing a road show that, despite the Ph.D.-touting partners' lack of social skills and their disdainful condescension of potential investors who couldn't rise to their intellectual level, netted a whopping $1.25 billion. The fund would seek to earn a tiny spread on thousands of trades, "as if it were vacuuming nickels that others couldn't see," in the words of one of its Nobel laureate partners, Myron Scholes. And nickels it found. In its first two years, LTCM earned $1.6 billion, profits that exceeded 40 percent even after the partners' hefty cuts. By the spring of 1996, it was holding $140 billion in assets. But the end was soon in sight, and Lowenstein's detailed account of each successively worse month of 1998, culminating in a disastrous August and the partners' subsequent panicked moves, is riveting. John Meriwether, a famously successful Wall Street trader, spent the 1980s as a partner at Salomon Brothers, establishing the best--and the brainiest--bond arbitrage group in the world. A mysterious and shy midwesterner, he knitted together a group of Ph.D.-certified arbitrageurs who rewarded him with filial devotion and fabulous profits. Then, in 1991, in the wake of a scandal involving one of his traders, Meriwether abruptly resigned. For two years, his fiercely loyal team--convinced that the chief had been unfairly victimized--plotted their boss's return. Then, in 1993, Meriwether made a historic offer. He gathered together his former disciples and a handful of supereconomists from academia and proposed that they become partners in a new hedge fund different from any Wall Street had ever seen. And so Long-Term Capital Management was born. ??????? ?In a decade that had seen the longest and most rewarding bull market in history, hedge funds were the ne plus ultra of investments: discreet, private clubs limited to those rich enough to pony up millions. They promised that the investors' money would be placed in a variety of trades simultaneously--a "hedging" strategy designed to minimize the possibility of loss. At Long-Term, Meriwether & Co. truly believed that their finely tuned computer models had tamed the genie of risk, and would allow them to bet on the future with near mathematical certainty. And thanks to their cast--which included a pair of future Nobel Prize winners--investors believed them. ??????? ?From the moment Long-Term opened their offices in posh Greenwich, Connecticut, miles from the pandemonium of Wall Street, it was clear that this would be a hedge fund apart from all others. Though they viewed the big Wall Street investment banks with disdain, so great was Long-Term's aura that these very banks lined up to provide the firm with financing, and on the very sweetest of terms. So self-certain were Long-Term's traders that they borrowed with little concern about the leverage. At first, Long-Term's models stayed on script, and this new gold standard in hedge funds boasted such incredible returns that private investors and even central banks clamored to invest more money. It seemed the geniuses in Greenwich couldn't lose. ??????? ?Four years later, when a default in Russia set off a global storm that Long-Term's models hadn't anticipated, its supposedly safe portfolios imploded. In five weeks, the professors went from mega-rich geniuses to discredited failures. With the firm about to go under, its staggering $100 billion balance sheet threatened to drag down markets around the world. At the eleventh hour, fearing that the financial system of the world was in peril, the Federal Reserve Bank hastily summoned Wall Street's leading banks to underwrite a bailout. ??????? ?Roger Lowenstein, the bestselling author of Buffett, captures Long-Term's roller-coaster ride in gripping detail. Drawing on confidential internal memos and interviews with dozens of key players, Lowenstein crafts a story that reads like a first-rate thriller from beginning to end. He explains not just how the fund made and lost its money, but what it was about the personalities of Long-Term's partners, the arrogance of their mathematical certainties, and the late-nineties culture of Wall Street that made it all possible. ??????? ?When Genius Failed is the cautionary financial tale of our time, the gripping saga of what happened when an elite group of investors believed they could actually deconstruct risk and use virtually limitless leverage to create limitless wealth. In Roger Lowenstein's hands, it is a brilliant tale peppered with fast money, vivid characters, and high drama. Disclaimer: this was the first-ever, and so far the only, "business novel" (as I call them), I have read. Hence my benchmark is not other books of the same genre, but literature in its broadest sense. LTCM is the pieced-together tale of the now fabled company of the same name, when a monstrously high collective IQ led to a monstrously large debacle. I am not going to get into details of the story - let it suffice to say that this is a world-class Wall Street / high-stakes financial world thriller. (For more details on the story, refer to the editorial reviews.) Instead, let me focus on the quality of the book and the emotions it evoked. This book is a top-notch thriller - there's just no other way to describe it. It's comparable in its speed, ability to engage, and narrative style to any of the best books of the pulp fiction genre, without actually belonging to it. What amazed me the most after I finished the book was that it had not yet been made into a mammoth-star-cast-large-budget Hollywood film, because it's really begging for that. (If there are any plans in the offing or the movie is already being made, then I apologize for my ignorance.) The book builds up the story of LTCM really well, and despite the fact that one is aware throughout of how it's going to end, the book remains completely engrossing. Lowenstein refrains from getting very technical, and keeps the book well within the reach of financial dummies like me. He does especially well do flesh out the characters, allowing one to really love, hate, or get exasperated with their antics. All in all, it's totally worth reading. And much as I hate the mutilation good books suffer at the hands of Hollywood, I can't wait for this one to be converted! The death of Longterm Capital Management (LTCM) is one of the biggest collapses in modern financial history. So big, the Fed stepped in and made a number of major banks pony up serious dough to cover LTCMs loses so that the world financial markets didn't tank. This book is the story of the very smart dudes (multiple noble prize winners, and a bunch of Phds) who made the classic finance mistake of thinking that markets would behave as the models said they would. Well, turns out, markets don't always do what they're told, and if your leveraged to the tune of billions of dollars, you can get yourself in a world of trouble when things go south. I'm not a fan of this book. He doesn't really explain what the trades were. He goes over two or three trades in some detail, but not enough for my taste. He also gives people feelings without referencing why or how he knows this. One CEO was in awe of a pivotal meeting, how does he know this (just one example). Its a great review of a collective of successful traders and very bright individuals (some are Nobel Laureates) who prove that under a lot of stress and pressure can easily fall victim to many of the behavioral errors and biases that are common in decision making. No matter how bright or talented an individual is, they are not above these human errors. This book is well written and is worth not just one, but many readings!! Mark Shore is Chief Investment Officer of Shore Capital Management LLC www.shorecapmgmt.com. He has contributed chapters to Wiley books on hedge funds and commodities. "It was the arrogance of people... who really believed that they were more intelligent than others." Even supposedly smart people can get utterly carried away. Perhaps they weren't as smart as they believed. In any case, we should always remember to take information and advice from "the experts" with a grain of salt. The definitive volume about Long Term Capital Management (LTCM) is highly recommended. It is a popular, non-technical and, to certain degree, moralistic guide to the birth of the extremely leveraged hedge-fund, and an exciting drama of the rescue mission during the credit crisis in September 1998. LTCM was founded by John Meriwether. The driving ideas was to assemble several really smart guys, get a big equity capital and leverage it heavy. Meriwether succeeded, and launched LTCM in 94, with two Nobel laureates, $ 2,5 billion in equity and banks promising loans to leverage it 30 times. In the first years the fund did rather well, returning more than 50 per cent return on equity in 1995. However, Lowenstein calculates that these results almost exclusively stems from the high leverage. After three good years, LTCM returns most of the equity to the customers, due to lack of good investment opportunities. Most of the remaining money belonged to the partners in LTCM, their main bank connections or the CEOs of the very same banks. During the summer of 1998, Russia gets in deep financial trouble. Credit spreads widen all over. LTCM bets they will narrow. In September, they widen even more, wiping out most of the equity of LTCM. The fund has to sell, but the banks and their own hedgefunds flee LTCM's positions before the fund, pushing the price even lower, wiping out LTCM completely. The lesson of the book is that debt is dangerous. To much debt is lethal. Even with the best and greediest guys on the planet, the fund could only stay afloat for four years. The banks who took over the remains, did profit on it. After all, in the long term, the trades were good. But the market stayed irrational longer than LTCM stayed liquid. One of the best stories about modern finance...this book must be read by everyone committing serious money into the markets. Written approximately 10 years ago, 10 years before the bankrupcy declaration by Lehman Brothers, "When Genius Failed" presents some timely lessons that should have been learned a decade ago...but weren't for some odd reason. #1 The issue of swaps: It is interesting that David Swenson of Yale is described here as inventing the first modern financial derivative--the swap. How ironic is it that Swenson makes no mention of investing in this toxic coolaid himself (in his books)? How ironic is it that losses in swaps were the #1 thing that brought down Long Term Capital...and all of Wall Street's titans were around to see it 10 years ago...and yet what are the financial derivatives bringing down companies like AIG today--the swap...You would have thought people would have learned! Avoid this crap! #2 Shame on John Reed from Citibank (he was Mr. Conservative, right? )and Alan Greenspan for opposing rules that would have required regulation and disclosure related to derivatives. In retrospect, this is absolutely nuts. Certainly, Citigroup is paying the price for its participation in these same markets now---how ironic that it would likely have really benefited by regulation it opposed. #3 It is of immense interest that Bear Sterns' Jim Cayne refused to participate with the LTCM bail out...leading other Wall Street firms to promise revenge...Well...look what happened 10 years later when Bear needed help...it was nowhere to be found. Does an excellent job of recounting the events and the people involved in the rise and fall of the hedge fund. The length of the novel is short enough to make it possible to read it in one go, the pace is fast enough, with none of the detours that authors are sometimes tempted to take (describing in excruciating and needless detail minutae that seem to serve no useful purpose other than that to fatten the book and make the tome appear more scholarly than it is). The author also does describe, in non technical terms, some of the financial instruments that were used by LCTM. These descriptions are by no means technical, and there is not a single formula in the entire book. Also, unlike some other authors, Lowenstein does not fall into the trap of describing the lifestyles of the protagonists in lurid detail. We do get a glimpse into how the main actors lived, ostentatious or not, but it never gets so involved so as to distract from the main purpose of the book, which is to describe the rise and fall of LCTM. What is also clear is that the author has a soft corner for Merriwhether, the brain and the soul behind LCTM. The Nobel laureates at LCTM come off as having too much faith in the mathematical certainty of their formulae, while the experienced traders at LCTM as also having drunk the kool-aid. These people, like Hillibrand, Haghani, and others believed so much in their skills and the correctness and certitude of the formulae that they staked their personal wealth on LCTM's success. Markets and investors do not always behave with mathematical preciseness, nor can their behavior be modeled and predicted using past performance or normal distributions (bell curves). Events can cause highly improbable events to turn into self-fulfilling prophecies. Markets are interconnected, and when things go bad, the correlation turns to one. Leverage by itself is not bad, provided liquidity is not a concern. You can be illiquid, and you can be leveraged, but not at the same time. These are just some of the lessons the author draws our attention to. One drawback listed by many reviewers of this book is that the book is not technical enough. Which is fair enough. However, it would be quite difficult to write a book that did justice to the twin objectives of recounting the events and history of LCTM as well providing enough technical details and background into the various theorems and intricacies of the financial instruments used by LCTM. Such a book would either run the risk of becomg very long, thus losing much of its intended audience, or become disjointed, with the narrative struggling to juggle between the characters, the plot, and the technical details. There are other highly rated books like 'Inventing Money' that are more technical in nature, and could be read in conjunction with 'When Genius Failed'. The Scam: Who Won, Who Lost, Who Got Away? I believe that this was the first book I ever read on the markets. And after reading many, many more, this may still be the best. This story of hubris, greed and, ultimately, ignorance of the realities of the market is certainly timeless; many successful traders have believed their own hype for many generations - and many more will do so in the future. Lowenstein's wonderfully written account of the infamous blowup of LTCM is truly one for the ages. Although a knowledge of financial markets helps, a lack of it didn't prevent this novice from loving this book. Now, many years later, as a much more experienced market participant, I can truly appreciate the lessons gleaned from this story. As I write this, the housing meltdown is in full force, and a developing credit crisis and derivatives unwind may make LTCM look like a fairy tale. Comparing this book with Lowenstein's book on Buffett, you can't help but think that his characterization of the people involved boils down to just this: he likes Buffett, and he doesn't like the LTCM guys. It gets to the point that various behaviors or character traits, presented as character flaws of the LTCM folks, are presented at least as neutral when attributed to Buffett. For example, Lowenstein takes the LTCM folks' secretiveness (their refusal to reveal the details about their trades, to, oh my God, their counterparts in rival firms), and spins it into a tale of inexcusable arrogance and paranoia. When Buffett, however, does the same thing to his partners in his first investment management venture, it is evidence of the singular wisdom that inevitably led him to his enormous success. Another thing is evident from comparing the two books: the LTCM books is primarily based on interviews with folks that were burned by LTCM. The Buffett book is primarily based on interviews with folks that owe their fortune to him. Lowenstein also admits, in the acknowledgements, that he's a longtime investor in Berkshire Hathaway. Other folks who understand this stuff better than me have done their job to critique Lowenstein's understanding of LTCM's investment approach. I did get the impression from reading this book that he very much was doing a hatchet job on the efficient markets hypothesis and the related investment technologies. I don't doubt that there's plenty of criticism that can be leveled at those, but Lowenstein clearly isn't qualified to do it, and what's worse, I don't come away from this book feeling like his mistakes are honest. The book has some merits, though: Lowenstein is clearly good at writing extended factual journalistic accounts, so you do get a credible account of how events unfolded. Still, this is not his primary goal--his goal is to tell you something about the meaning of the events he describes and the character of the people involved--and I judge that he fails at that goal. Two things make this a great book: a riveting story (losing hundreds of millions a day is mind-boggling) and excellent writing. Roger Lowenstein, first of all, is a master of using analogies explain complex things, like financial derivaties and how the big investment banks operate. Long Term Capital Management was a gang of complex gamblers (including a couple of Nobel Prize winners to boot) that employed equations and theories from the academic world of finance to build an enormously successful hedge fund that sucked in the big banks of Wall Street. Lowenstein details the rise of LTCM (it seems it had to have taken place with an interesting mixture of Luck, Smarts, and Arrogance) and their massive and rapid failure with a cadence that makes it difficult to put the book down. When Genius Failed offers a glimpse into the world of big-time finance and the unrepentant and bizarre characters that it attracts (the money these guys rake it in and how they do it will stun you if you aren't familiar with Wall Street). Highly recommended - even a decade after the collapse of LTCM! Very Good Book and a look at "the Experts"
As an academic & a "Wall-Streeter" & a professional trader (of my own money) I must surely qualify as an "expert." This book shows how those who talk a good story and thus are "experts," really cannot translate the talk into profits. This book is a case study in just how great a distance there is between publishing, promulgating, teaching, managing and actually making money in the securities markets. LTCM was run by the best talkers we have and was a collossal failure and this is no accident. For those interested in getting a good primer on how to profit in the markets, I suggest "The Psychology of Investing." This is a valuable book to read as it delves deep into people making very big mistakes. If these geniuses can make such errors of judgement, surely anyone can. That's why it is important to read this story and learn valuable lessons through their failures. The partners of Long Term Capital Management were arrogant and too proud for their own good, but what really brought them down was their failure to recognize their own weaknesses and limitations. Warren Buffett talks about staying in his "circle of competence" as being one of the keys to his success as an investor. Some of LTCM partners were brilliant mathematicians. They were probably better suited to more scientific jobs. Unfortunately, they ventured beyond their circle of competence. Investing and finance is clearly not a pure science. As Lowenstein states one can predict how a drop of cream dropped into a cup of coffee can spread using hard scientific models, but the LTCM partners foolishly thought that they could extrapolate the hard scientific laws to finance and economics. One of the partners, Hilibrand, who was smart enough yo get 2 Phds from MIT was not smart enough to recognize this fairly simple concept. It could happen to anyone. We have certainly witnessed it with many Presidents and world leaders. Another valuable lesson of this book is how people can fool themselves. "You must not fool yourself and you are the easiest person to fool." The partners wanted so desperately to turn finance into a pure mathematical science. They quantified the chances of the fund losing say 5% in one month much like how a mathematician can tell you the chances of your winning the lottery. They believed and fooled themselves into believing their models. It does not become true just because you so desperately want it to be true. This is a very readable and mostly convincing account of the rise and fall of Long-Term Capital Management. It makes it clear to me how the fairly common problem of success breeding overconfidence led LTCM to make unreasonable gambles, and why other financial institutions that risked their money by dealing with LTCM failed to require it to exercise a normal degree of caution. The book occasionally engages in some minor exaggerations that suggest the author is a journalist rather than an expert in finance, but mostly the book appears a good deal more accurate and informed than I expect from a reporter. It is written so that both experts and laymen will enjoy it. One passage stands out as unusually remarkable. "The traders hadn't seen a move like that - ever. True, it had happened in 1987 and again in 1992. But Long-Term's models didn't go back that far." This is really peculiar mistake. The people involved appeared to have enough experience to realize the need to backtest their models better than that. I'm disappointed that the book fails to analyze how this misjudgment was possible. Very interesting book about quants on Wall St.
* - if you have to chose between torture and reading this book, then you might want to consider reading the book - although it depends on just how severe the torture would be. ** - if you've lost your job and have quite a bit of free time on your hands, and don't have anything else better to do, then you might want to consider reading this book; don't expect to learn much or really be entertained. It will however, help you pass the time until your death. *** - meh...I'm indifferent. Reading this book will not alter your life in any significant way, yet it is not so horrendously dreadful that your taking the time to read it will be a complete waste of time. **** - Good book to great book zone here. You should probably read this book if you have some spare time. This book could be interesting, entertaining, or informative. ***** - Outstanding book! Make time to read this book - you'll learn or be entertained or intrigued. The book might even be good enough to provide original or helpful insights into the world that we live in. When Genius Failed was an enjoyable and informative read about the rapid success and even more rapid implosion of the legendary hedge fund, Long-Term Capital Management. The book covers the development of the fund, the personalities behind it, the fund's strategies and the theory underlying them, as well as the failure of the fund. The author seems to emphasize the reliance of LTCM on statistical models to make their investment decisions, and how these models failed to account for patterns in group behaviour which consequently resulted in events occurring that were all but statistical impossibilities. It was this coincidence of unlikely events that led to the fund's collapse. Human nature always trumps theory but the boys at Long-Term Capital thought they'd found a way around that. The cast of characters is not as colorful as those of other great business books, say "Den of Thieves" or "Conspiracy of Fools" but much of the same behavior is on display. Greed, arrogance, pettiness, more greed and plenty of hubris. This book is a must read. It documents some valuable lessons in investing and trading: always use stops and don't be greedy. Also, parallels to the current financial crisis are stunning. LTCM crisis seems to have been a small-scale implosion of the markets and now we are going through its large-scale version. Author also explains the problems with Black-Scholes option pricing and assumptions it makes (volatility as a constant or rather a fixed range). For a more in-depth technical analysis, get "Inventing Money" as well. "When Genius Failed" is an engaging chronicle of the rise and fall of Long-Term Capital Management. Folks who were reading the business pages in the late-90s will remember the sudden travails of this fund -- and of the capital markets in general. And even if you have just a passing interest in finance, you'll find Lowenstein's book fascinating. He profiles the principals of the management company, their investment philosophy, the fund's tremendous early success, and the circumstances and decisions that led to LTCM's collapse. I liked this book so much that I have re-read it twice in row before writing this review. As you see, this book is so popular that I'm the 200th reviewer of this title on amazon.com. The book tells the story of Long-Term Capital Management (LTCM), a hedge fund founded in 1994 by John Meriwether (the former vice-chairman and head of bond trading at Salomon Brothers). On its board of directors were Myron Scholes and Robert C. Merton, who shared the 1997 Nobel Memorial Prize in Economics. Initially enormously successful with annualized returns of over 40% in its first years, in 1998 it lost $4.6 billion in less than four months and became a prominent example of the risk potential in the hedge fund industry. On the precipice of not only an American financial disaster, the fund's imminent collapse had significant international monetary implications, jeopardizing the financial system itself. Prompted by deep concerns about LTCM's thousands of derivative contracts, in order to avoid a panic by banks and investors worldwide, the Federal Reserve Bank of New York stepped in to organize a bailout with the various major banks at risk. "When Genius Failed" reads like a best-selling novel, but happens to be based on real events. This book covers the rise and fall of Long-Term Capital Management, a highly visible and famous hedge fund. Roger Lowenstein expertly threads source material, such as internal memos, macroeconomic theory and a sense for the personalities involved in this story, into a dynamic and page-turning publication.